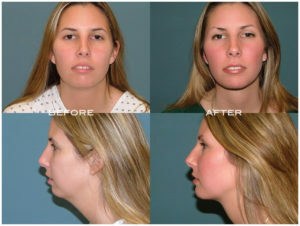 Chin and Cheek Implants, or mentoplasty, are a way for a patient to re-contour the facial structure. A chin augmentation procedure (also known as genioplasty) is a cosmetic surgical procedure which improves the overall balance of the facial features. This surgery corrects a disproportionate chin caused by congenital deficiency, age-related bone resorption, or an accident. Cheek implants, or malarplasty, add a new ampleness to the face. With new cheeks and a new chin, a more balanced and symmetrical face can be achieved giving you a new sense of confidence.